Standing Seam metal roofing is beautiful, durable and energy efficient. Our standing seam metal roofs are available in over 35 colors. This allows standing seam roofs to look great on your entire roof, or even as an accent on a bay or bow window. Give your home the curb appeal you desire with a standing seam front porch or overhang to match any color scheme your home has. All standing seam roofing finishes are backed by a 35 year warranty to stay as beautiful as they are today. Our metal roofs are made out of 24 gauge steel and have been proven to withstand the harshest elements. Our standing seam metal roofs are tested against 140 mph winds and are guaranteed not to be damaged. They also come with a Krynar coating which prevents fading, rotting, chipping and cracking. 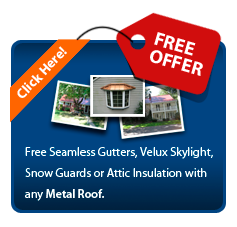 Standing seam metal roofing will last more than 2 times the life of roofing shingles. Standing seam metal roofing will allow you to have the “greenest” house on the block. The metal reflects the sun’s rays, which in turn reduces heat transfer to the house. This can have a significant impact on you heating and cooling bills. In many cases, standing seam metal roofing will lower your cooling costs by up to 30%.